Project Rug - malariaresearchhus Webseite! The malaria parasite, Plasmodium falciparum, can only escape the immune system of its human host by cytoadhering to receptors on the endothelial cells in vital organs. It achieves this by expressing a virulence complex on the surface of infected red blood cells. 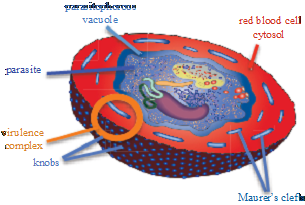 Maurer’s clefts are organelles in the host cell, established by the malaria parasite, that play a crucial role in assembly of the virulence complex. In the absence of individual resident Maurer’s clefts proteins [1-3], the major virulence factor PfEMP1 does not reach its final destination and the cells cannot cytoadhere. Plasmodium berghei has similar organelles to Maurer’s clefts called IBIS (intraerythrocytic P.berghei-induced structures; [4, 5]) with as yet unknown function. The Rug group has recently identified the components of the Pf virulence complex (Fobes, Rug, Maier, unpublished). This project aims to characterize the assembly and function of these individual components in a cellular context, especially with respect to the role of Maurer’s clefts and IBIS proteins.